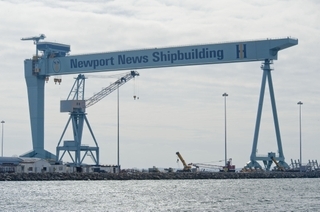 NEWPORT NEWS, Va., Nov. 8, 2011 (GLOBE NEWSWIRE) -- Huntington Ingalls Industries (NYSE:HII) announced today that Newport News Shipbuilding's name has returned to its perch 233 feet above the shipyard. After more than 10 years, 250 gallons of primer and 260 gallons of paint, the Newport News Shipbuilding name once again sprawls across the downtown Newport News skyline on the girder of the shipyard's 1,050-metric ton gantry crane. "This is a proud moment, not only for the 20,000 shipbuilders at Newport News Shipbuilding, but for the community we've been a part of for the last 125 years," said Matt Mulherin, corporate vice president and NNS president. "Returning to the Newport News Shipbuilding name and logo under Huntington Ingalls Industries reinforces our heritage and our continued commitment to quality, customer focus and building the world's best military ships." Shipbuilders from the shipyard's Facilities and Waterfront Support organization and painting contractors contributed hundreds of man-hours to the 33,000 square foot paint job. Shipbuilders provided all the planning and support activities, including installing the paint scaffolding hundreds of feet in the air. Snap Contracting of Hampton painted the crane girder in the traditional "Northyard Crane Blue" paint color. Sign Media of Hampton painted the logos and lettering, which included 96 paper templates to lay out the artwork. At 360 feet long, "Newport News Shipbuilding" is painted "Blueblood" blue. NNS's spear and gear and the HII logos are 28 feet tall in the colors "Blueblood" and "Honeycomb."